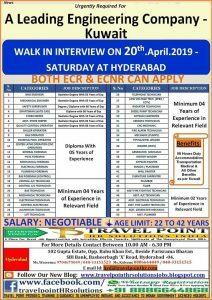 walkin INTERVIEWS travel point HYDERABAD: Flash news!! Yes today we are ready to announce about one of the latest job notification. 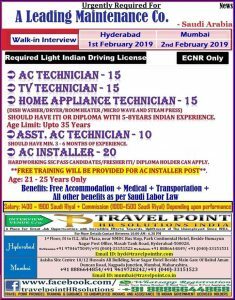 Candidates who are struggling in job search those can use this one of the job opportunity to crack the job.Urgently required for gulf countries. 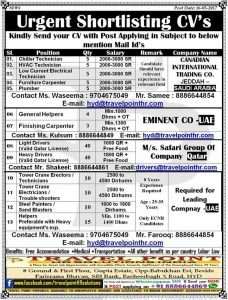 Aspirants who are waiting for job notifications from this company those can utilize this job chance without fail. Salary: 2449 in Saudi Riyal. Job description: Candidates should have minimum 3 to 5 years of experience. Candidates should be able to assemble valves based on the assembly drawing work instruction and provided parts. Candidate should be able to ascertain that the assembled piece will perform its intended function. The technical course in the mechanical engineering field. Aspirants should have a year experience in the valve. Job description: candidates should have minimum 5 to 6 years experience. Candidates should have a group of coating technicians. Candidates will have to prepare daily productions reports. Aspirants should have a diploma or high school certificate. Job description: candidates should have minimum 5 years experience. Candidates will have to coat vale some accessories with the fluid method. Candidates should have a diploma or high school certificate. Job description: candidates should have minimum 2 to 3 years experience. Candidates will have to perform testing of valves check for leaks and whether is it performed according to intended function. Candidate will have to prepare whether valves are for approved scrapped or for rework. Candidates should prepare and submit testing reports on time. Candidates should have a technical course in mechanical engineering or related course. Job description: Candidates should have minimum 3 to 5 years experience. Candidates should have at least 2 years of gulf experience. Candidates should have Nibosh or Osha Certificate. Job description: candidates should have minimum 5 to 7 years experience. Candidates should have at least 2 years of gulf experience. All other benefits as per Saudi labor law. Your CV will be selected by the official authorities of recruitment board. So, aspirants who are interested and fulfilled the eligibility criteria for the above-mentioned job posts those can forward their CV to this official MAIL ID. I looking for abroad job fmcg QC inspector/ checker/ executive jobs kindly opportunities details any? dear sir is there any vacancies for 1 year experience candidates in IT field or Administrator please reply for this query thanking you. Please find attached file Myself Sartaj Mohammed Khan.Now I am working with Abdullah A.M.Alkhodari sons co. As a Plumbing & Fire Fighting Draftsman- Mechanical- (Auto cad)since 2012. I have 6 years’ experience.I am waiting for your favorable reply. I’m Raj. I want to do work in dubai. 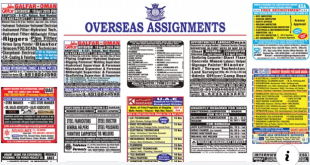 I have a experiance as a office assistant in dubai. So pls sir can u help me. 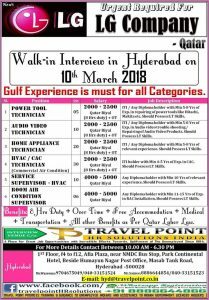 this is Abdul fayaaz.I have a expperiance as a sales supervoisor in Hyd.so i need to job in ths field in gulf country.so pls sir help me. Sir i have 4 year experienceas civil site engineer.. i want to gulf… i m trying for it from last 2 year.. plz guide me so that i can achive my goals… have a gud day. I am a crawler and mobile crane operator, 11 years experience also. I want to job abroad and my WhatsApp no is 8339984330, 8018046490. 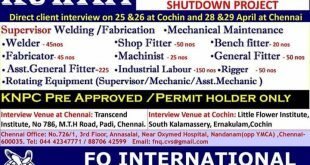 I looking for abroad job HR cordinator& office administrator jobs i have 6 years gulf exp..
looking for job in gulf-overseas in Road Foreman with 12 Yrs Experience in Road & infrastructure. I’m looking for – executive secretary / hr / logistics /sales/ admin/Ground Staff & Customer Service. Looking for job. Iam Rajesh.now Ian in India.I have 9 years experience supervisor (sales advisor )in Dubai. overall i have 7 years experience as a hse officer in gulf . Good Morning , i am happy to introduce myself Dr.Konda.Hari Prasad Reddy , professor of Economics and i had have around 24 years of teaching ,administrative,research and community service experience. i had worked with the same designation in Euthoipia for 3 years and looking for the same position i Middle East. i am requesting you to look into my profile and please extend your support for my placement. i had sent my profile along with necessary credentials for your information. I am writing this application for the position of RF engineer. I am an RF engineer at Air Voice Technologies and an engineering graduate with specialization in Digital systems. I commenced my career in the year 2015 after I completed my studies. My first job was at Air Voice Technologies. I worked for the research, design, development and testing of radio frequency devices for mobile phone devices. Hi..Sir My Self ZUBER AHMED from KARNATAKA DIST BIDAR.. I have 3 Years Experience In L&T Company As A SAFETY OFFICER POST , EDUCATION BSC IS PARSUING ,PUC SCIENCE PASSED OUT.. I have 4.5 year’s experience. 1 year Kuwait return & now working in MP INDORE in HR CONTRACTION . I am surching to job in gulf. Plz tell me. I have 4.5 year’s experience in LAND SURVEYOR. 1 year KUWAIT return &now working IN MP INDORE in HR CONTRACTION. 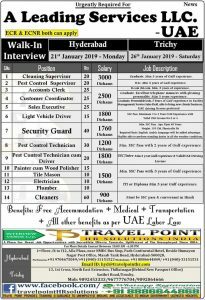 I am surchin to job in Gulf. Plz tell me. I looking for Gulf job for AUTO CAD & HVAC DRAFTSMAN & i have 2 years exp..
i want restaurant visa of Kuwait . 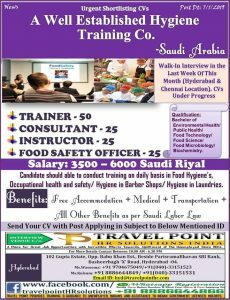 i have two years experience of Saudi arabia. there i was working in canton restaurant . there i used to make chinese food .